“True, Kind, Necessary and Complete”: This concert will be about expressing yourself with authenticity. We will create a song to enable you to say your truth without fear (of judgement etc) and to do so with great compassion and kindness. May all your words be true, kind, necessary and complete. It is the song of the 5th chakra, the throat chakra. 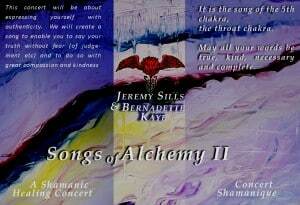 The intent and theme of this shamanic concert is about expressing ourselves with kindness, truthfulness and honour. It is not easy to attain the balance of expressing ourselves gently while honouring our own boundaries….what a balance! Sometimes, the best thing to do is to remain silent. Other times, it becomes necessary to set limits and other times still, the highest interest of all is to simply nod…..but to tell the difference? The highest way to achieve such harmony is to have a clear throat chakra and so Jeremy and I will play our instruments -and our voice- with the intent to infuse transparency, strength and love into speech. We will use crystal bowls and other musical healing instruments. When the throat chakra is vibrant and strong, the words are healing to all present. When the throat chakra is heavy with anger, victim energy, control or envy, the words hurt and destroy all present. Words can heal and words can hurt….it all depends on the heart. As usual, Marjoli will be painting the sounds and raffling the resulting canvass at the end of the concert (buy tickets for the raffle at the door). Just so you know: Marjoli cannot “see” with her physical eyes in the darkness of the hall, all the colours look pretty much grey because we dim the lights to play our concert….she feels the colours and the result is always vibrant and quite spectacular….not to mention beautiful. I hope to see many of you at the concert. You are part of the energy field that Jeremy and I weave with music. This is about alchemy. Alchemy and the Songs of Alchemy (the name of our concerts) is not about transforming you into something new or different. It is about letting your true essence shine out unto this reality. This is about transforming into what you already are: beings of impeccable speech, full of love and light. May your words be kind, true, necessary and complete !